Fresh strawberries are only available for a few fleeting weeks every year. And I believe in taking as much advantage of those weeks as possible. When I was young, my mom would make strawberry shortcake at the start of every summer when the strawberries started to ripen. She would go out in the early morning and pick berries at the patch just down the road, and that evening we’d be having stacked shortcakes for dessert. Oh the baked goods I took for granted. 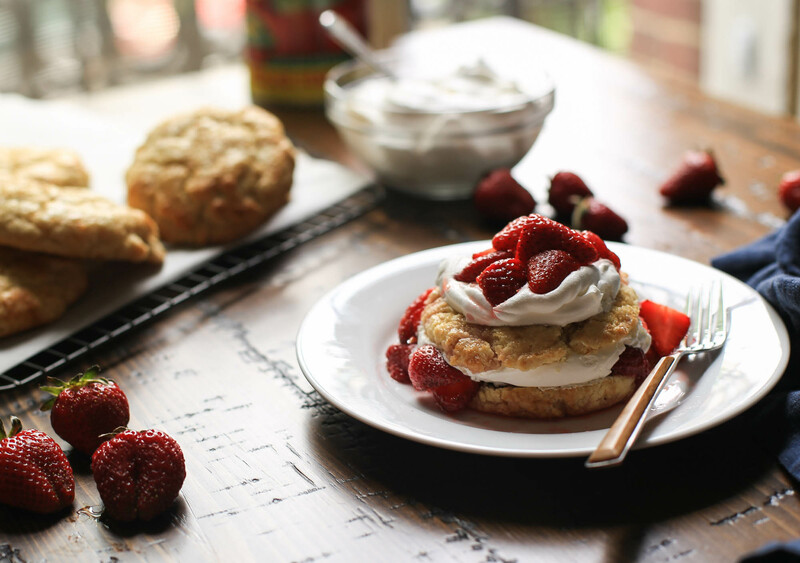 Fresh, juicy strawberries, spooned over sweet baked shortcakes, topped with a huge dollop of cool whipped cream. Dessert cannot get better. Strawberry shortcake is my ideal treat. As in, it should be part of my last meal. And I would eat one every day if only that meant I wouldn’t gain 300 pounds. Well actually….it has strawberries, and those are healthy right? It’s one of the few things that I eat where I savor every. single. bite. It’s love, baby. Last year for my birthday I made carrot cake from scratch, and this year I’m celebrating with another more-complex-than-usual baking recipe. It’s apparently how I like to honor the occasion. 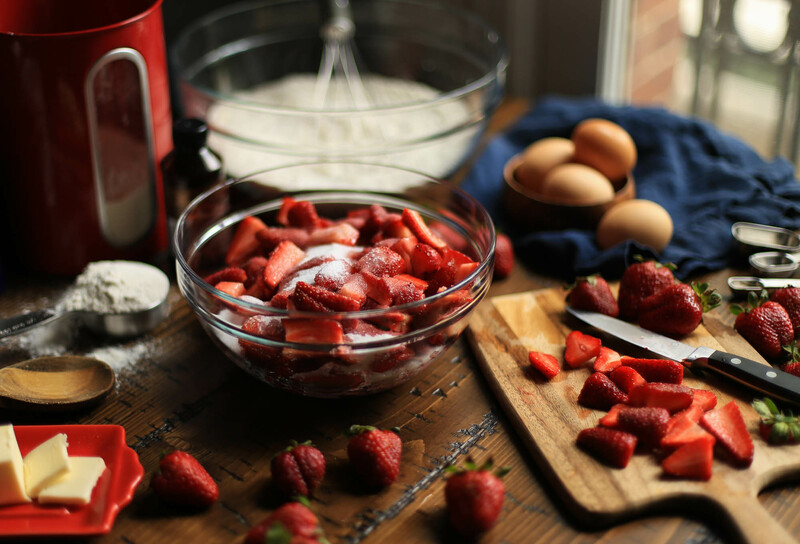 The first step is to mix strawberries with some sugar and let them sit at room temperature to really bring out the juices. Then focus on the shortcakes. 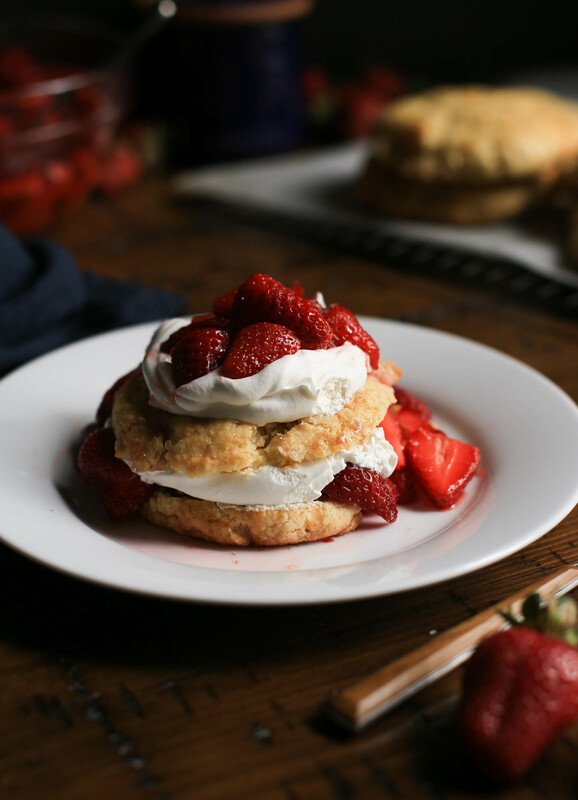 Using cake flour makes these shortcakes lusciously light, crumbly, and rich. Perfect for soaking up the juicy strawberries. Mix the ingredients together and then turn out the shaggy dough onto a lightly floured surface. 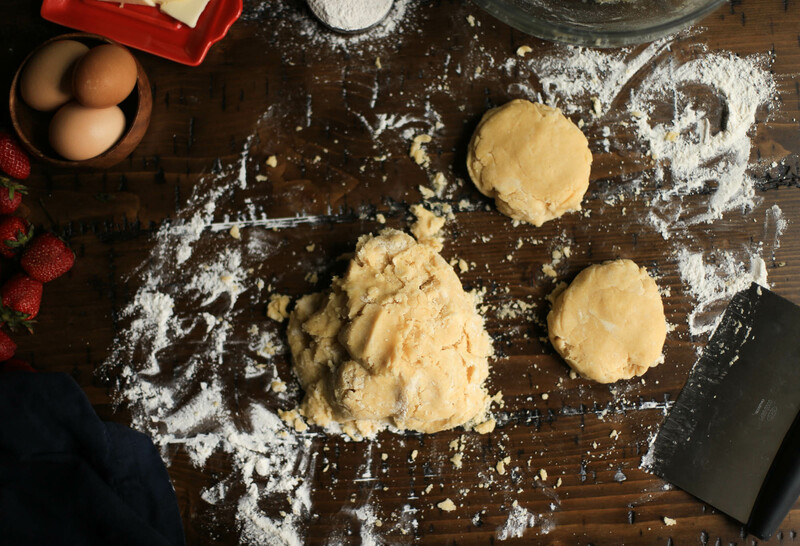 Use your hands to form the dough into a ball. Divide up the ball into 6-8 even pieces, depending on how big you want the shortcakes. When I asked my mom about how large to make the pieces, she told me it’s about the size of her fist. So, there ya go! Really don’t worry about getting them exactly even, they’re supposed to look rustic. Form the pieces into a ball, place on a baking sheet, and slightly flatten them with your palm. Then let the shortcakes chill the refrigerator for about 20 minutes before baking. 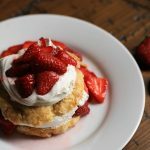 Bake until golden, and then serve (to some LUCKY people), topping the shortcakes with syrupy strawberries and whipped cream. Another option is to make strawberry shortcake for a party. You can make multiple cakes early in the day, let them cool, and store them in an airtight container up to a day ahead. My mom made this strawberry shortcake recipe for the entire crowd at my bridal shower. That’s 30 hungry ladies! That’s how I know this recipe is simply, the best. But also when your husband states this is one of the best recipes you’ve ever made, you know you have a winner. So here’s to another year, a delicious birthday celebration, and what the heck, to Cindy Lauper, another great product of the ’80s. 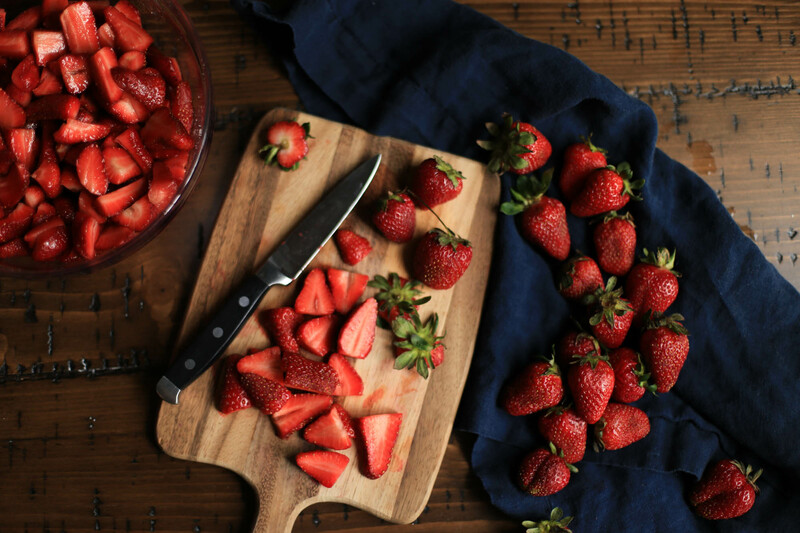 Prepare the strawberries by washing them thoroughly and removing the stems. Slice into quarters and place in a large bowl. Pour 1/2 cup sugar over the berries and stir to coat. Let sit at room temperature while you make the biscuits. The sugar will help slowly release the juices of the strawberries. Line a baking sheet with parchment paper. Cut the butter and shortening into small cubes and place back in the refrigerator for 10 minutes. Whisk together the remaining sugar, cake flour, all purpose flour, baking powder, and salt in a large bowl. Mix in the cold butter and shortening with your hands until the mixture resembles coarse meal, with some pea-size bits of butter remaining. In a small bowl, whisk together the egg yolk, heavy cream, and vanilla. Transfer one tablespoon of the mixture to the egg white and stir. Stir the rest of the cream mixture into the dough until the dough becomes shaggy and lumpy. Turn the dough out onto a lightly floured surface and pat into a ball. Cut the dough into six or eight even pieces, depending on the size you want. Roll the pieces into balls. Arrange on the baking sheet and slightly flatten with your hand. Place in the refrigerator for 20 minutes to chill. Preheat the oven to 400 degrees F.
Remove the cakes from the refrigerator and brush the tops with the egg white mixture to give them a golden crust. Sprinkle with turbinado sugar. Bake for 13-18 minutes, until puffed and lightly golden, and a toothpick inserted into the center comes out clean. Transfer to a cooling rack for 10 minutes before serving. Serve layered with fresh and macerated strawberries and whipped cream. 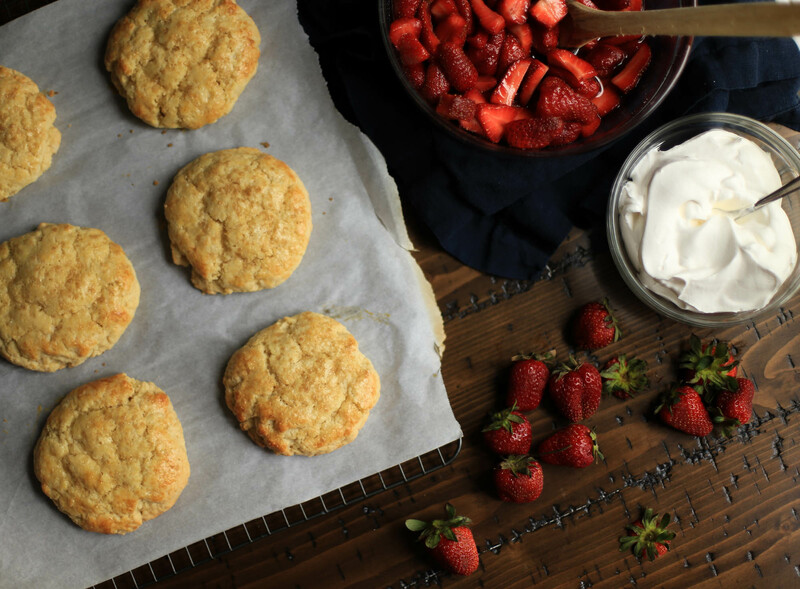 The shortcakes can be served warm, at room temperature, or once cooled they can be stored in an airtight container for 1-2 days. 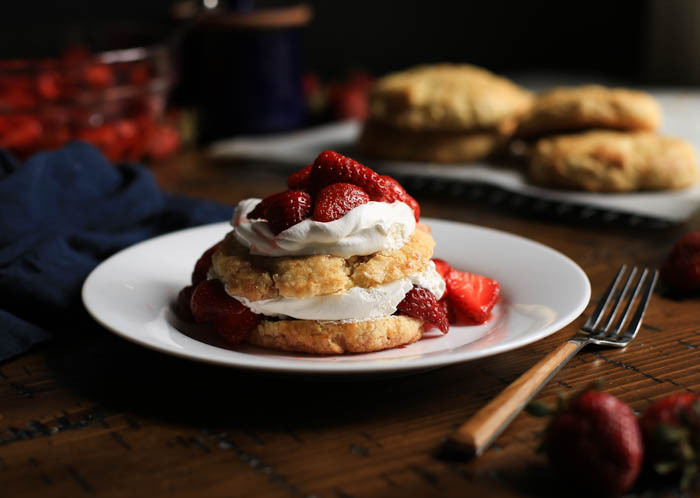 For more layers, cut the shortcakes in half gently, with a serrated knife. Pile strawberries and whipped cream on the bottom layer, followed by the top crust, and then more strawberries and cream. Don't be shy! The recipe is easy to make ahead in larger batches for a crowd. Don't assemble with strawberries and cream until ready to serve. Yay! Let me know how it turns out. I could eat one every day.